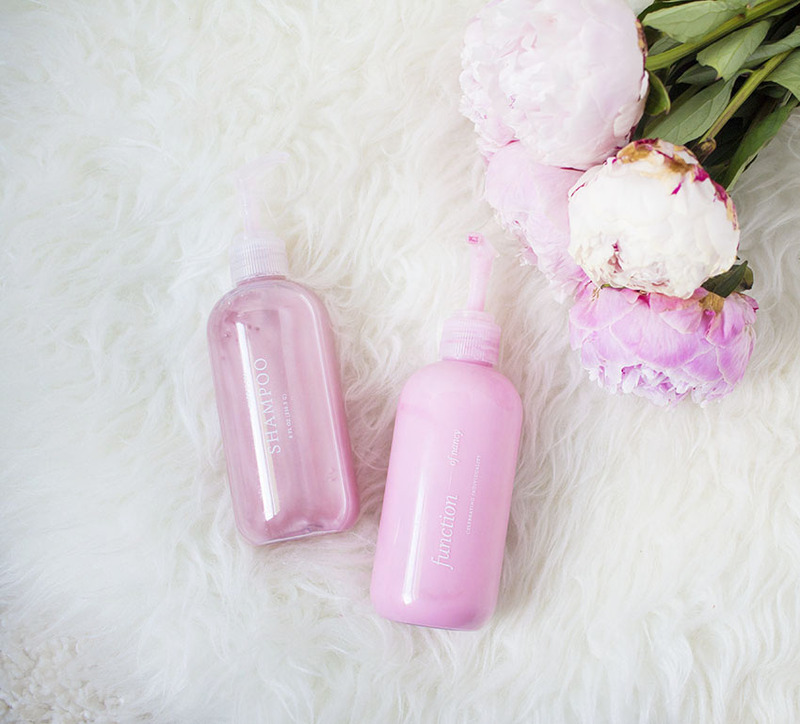 When I first saw these beautiful bottles floating around the internet I had to know what they were and where to get my own! I quickly found out that they were shampoo and conditioner custom prepared for your specific hair needs. You start off by taking a hair quiz where you select the type of hair you have and your hair goals. A little background on my hair: it's wavy/curly, medium thick and dry. For my hair goals I picked hydrate, soothe scalp, anti-frizz, thermal protection, and deep condition. Then you can go on to choose your shampoo and conditioner color - I picked pink, of course! They also let you pick your fragrance (I chose essential oils) and its strength. You get to finish off your formula by giving it a name (How cool is it to have your name on your shampoo bottles!). They have many size combinations to choose from but since I was just testing it out I went with their smallest, the 8oz bottles for $36. Not too bad considering it's going to be custom created for my hair goals. They offer free shipping and free returns, so that's a plus! The shipping took a lot longer than I expected - about a week. 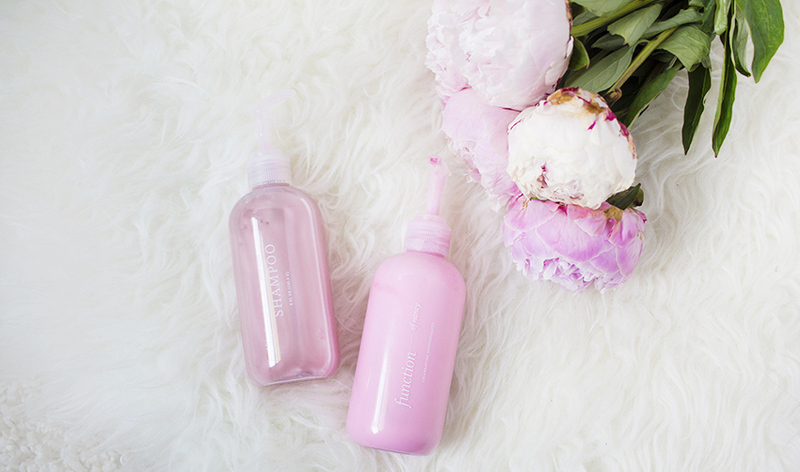 I've been using my custom shampoo and conditoner now for two months and I love it! Not only is it pretty to look at but it smells so lovely too! The price is higher than I would like but it's going to last me a while. I wash my hair 1-2 times per week, use a generous amount of product and I'm not even halfway through the bottles yet. Function of beauty shampoo: I love the clean and refreshing scent from the essential oils (mine smells like eucalyptus). It gives my scalp a minty cool feeling that I love while also preventing dandruff. I noticed that it's formulated without sulfates so I was worried it would be watery and not lather well. I was pleasantly surprised by how nicely it lathered. It cleans my hair just enough to not make it feel stripped of its natural oil. It also made my hair feel noticably silkier and smoother. Function of beauty conditioner: It has the same wonderful eucalyptus scent as the shampoo. It's very creamy and together with the shampoo makes my hair feel softer than before using these products. It's great however I think it could be a tad more moisturizing. Like I mentioned above, my hair is dry and needs all the moisture it can get! But with it being customizable I'm sure I can go into my Function of Beauty account and change up my formula for my next set. Since this is custom made the product will vary from person to person but I think this product is worth trying out! Let me know if you've tried it before? P.s. You can get $5 off your order using this link. Never heard of Function of Beauty but it sure sounds like a nice concept. Not sure if it'll be good fit for me and my hair. However, I see a lot of ladies willing to give it a try. Thank you Vivi!! It's a really cool concept and has been working wonderfully on my hair!